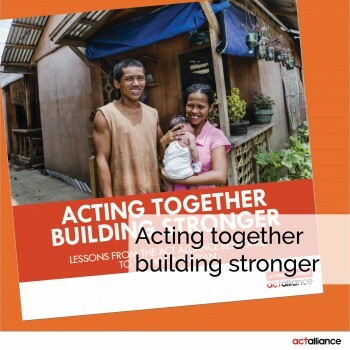 The ACT Philippines Forum is a platform for ACT Alliance member organisations that support development, advocacy and humanitarian activities in the Philippines. The Forum was formally established on July 31, 2013 (although regular coordination meetings had been taking place amongst members since 2009). It brings together organisations that are committed to the mission, vision, and values of the ACT Alliance in humanitarian, development and advocacy work, and are bound by a commitment to empower communities, and build their resilience to cope and overcome risks. The Forum’s mandate is to strengthen coordination and cooperation among ACT Alliance members in the Philippines, so that members work as an alliance in emergency preparedness and response, development, and advocacy. In working collaboratively, the ACT Philippines Forum seeks to increase the efficiency, effectiveness and impact of our ecumenical humanitarian and development response, and to create a bigger voice for our advocacies hand in hand with partners and communities. Shortly after its establishment in 2013, the ACT Philippines Forum was tested by the massive destruction brought by Super Typhoon Haiyan. With support from ACT member churches and agencies, and in collaboration with local partners, the ACT Philippines Forum undertook emergency responses in 16 provinces affected by the super typhoon. Since then, the ACT Philippines Forum has collaborated in responding to the needs of communities affected by other disasters (Typhoons Lawin and Nock-ten, and the Marawi Conflict). These are responses in faith to the command to “give them something to eat”, and a demonstration of how two fish and five loaves can be shared not only to feed thousands but to ensure the re-establishment of loving and caring communities. The ACT Philippines Forum believes that our interventions should be built on local initiative, and the knowledge and resources of disaster-affected, poor and marginalised communities, and of organisations and churches closest to those communities, to enable and ensure the most appropriate and effective preparedness, emergency, rehabilitation, and recovery responses. The ACT Philippines Forum is also committed to helping ensure the sustainability of local organisations through helping them build capacities and mechanisms for resource generation. Individual members of the ACT Philippines Forum will support and undertake capacity-building initiatives for resource generation and fund management of local organisations.